Running may be an individual sport, but for Aaron Cooper, teamwork is key. “It’s way more fun to have people to endure it with,” said the Camlachie marathoner, currently ranked third in Canada following a bronze Canadian finish at the Scotiabank Toronto Waterfront Marathon last month. “There were three of us working together throughout the race. 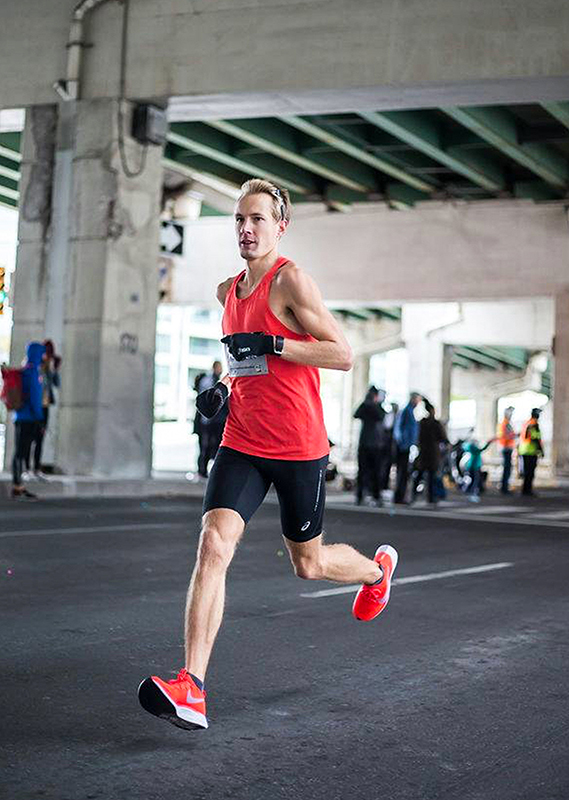 I started to pull away around the 39 kilometre mark,” said Cooper, 32, who put up a personal best time of 2:18:00, behind two-time Olympian Reid Coolsaet (2:17:37) and a Canadian record-breaking performance by Cam Levins with 2:09:22.
Cooper finished 11th overall in the Oct. 21 event. The 32-year-old software developer and married father of two says he’s at the peak of his career — and no goal is off limits. That includes the 2019 World Championships in Doha, Qatar, and the 2020 Olympics in Tokyo. “I figure if I just keep focusing on my own improvement, hopefully I’ll be in a good position to try for some of these cool opportunities,” he said. This marked Cooper’s eighth marathon in five years, including a first place finish at the Glass City Marathon in Ohio last spring. He describes himself as an ‘off and on’ runner in his early years — doing cross country at Errol Village school and St. Clair Secondary — and running in his last two years at the University of Waterloo. He finished fourth overall at his very first race in Niagara on the Lake, just two minutes shy of the Boston Marathon qualifying time for his age group that year. “The goal is really just to see what I’m ultimately capable of,” said Cooper, who runs up to two hours every day, rain or shine. His family plays a huge role in his success, Cooper said, noting it’s not easy to fit it all in with two young kids. Sometimes that means early morning runs, and relying on grandparents to take on some of the childcare duties.